NYC, 02/15/2019, 2:00PM. 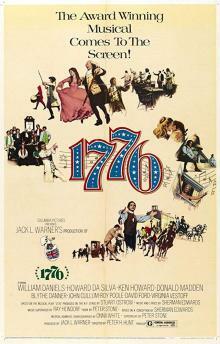 1776 (1972): Musical drama based on a Broadway play. 141 min. Director: Peter H. Hunt. Starring William Daniels, Howard Da Silva, Ken Howard. The screenplay by Peter Stone was based on his book for the 1969 Broadway musical of the same name. 1776 was nominated for the Golden Globe Award for Best Motion Picture - Musical or Comedy. Harry Stradling Jr. was nominated for the Academy Award for Best Cinematography.